Saute the onion with olive oil and a pinch of salt in the bottom of a large, heavy-bottomed soup pot, until golden brown and starting to caramelize – about 10 minutes. Add garlic, carrots, celery, salt and pepper and saute gently for about 10 more minutes until completely cooked, stirring occasionally and deglazing sides and bottom of pot with water every once in a whole as needed to keep it from sticking. This long slow cooking process at the beginning sweetens the vegetables and is what gives richness and depth to the soup, so make sure to put the time in here. Stirring constantly over medium flame, add quinoa, paprika and pimentón, toasting the quinoa for a few minutes in the hot oil. Add water/stock, bay leaves, cumin, soy sauce and nutritional yeast, and 1 t. salt, lentils, green peppers, sweet potato and potato chunks. Bring to a boil and simmer gently for 30 -45 minutes, or until lentils are cooked but firm and potatoes can be cut with a fork. Taste and add red wine and a splash of umeboshi vinegar or Braggs amino acids. (These give the “6th sense flavor” which the Japanese call umame. Soy sauce can also be used). Thin with water if necessary to desired consistency. 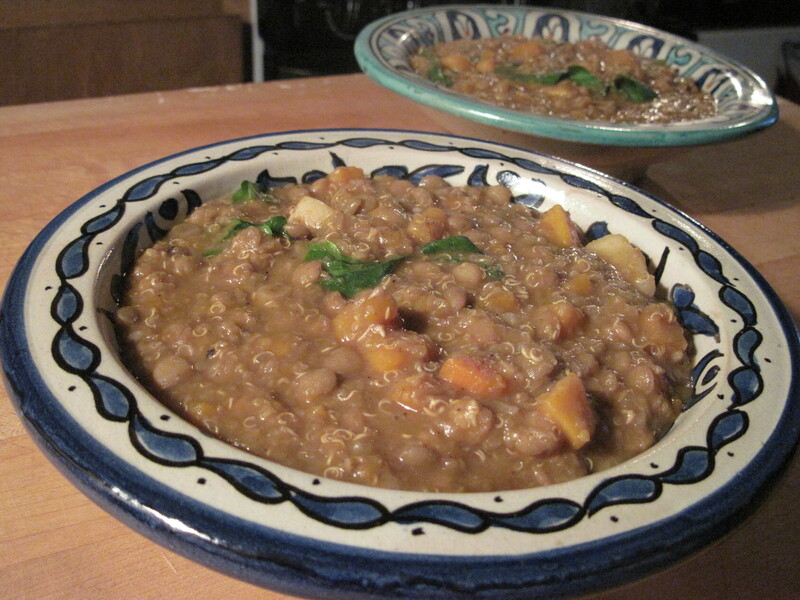 These lentils can be served thin and soupy or very thick, piled up in a shallow bowl, depending on your preference. Adjust salt and freshly ground black pepper. Mix in fresh parsley just before serving. These lentils are great with a side salad and thick slices of toasted garlic bread, or served alongside Tortilla de Patatas (a Vapor!). Where can I find Real Milk?